Will I see you on Monday? Last week, I announced that throughout Fair Shot February, rides on the DC Circulator will be free. Do you have other ideas for how we can give more Washingtonians a fair shot? Want to learn more about the programs we already have available? On Monday, February 4, join me and my team at the Wilson Building Open House. At the open house, you can ask questions, meet the leaders and public servants who keep our city moving forward, and find out more about the programs available to District residents and businesses. Moreover, after coming to the open house, you'll be fully prepared to make your voice heard at one of our upcoming budget engagement forums. Those who have been to these forums in previous years know that they are lively events where residents are able to advocate for their budget priorities and share their vision for the future of DC. I hope to see you on Monday and then again at one of the forums. Metro promised the region that late night service would return on July 1, 2019. Now they’re trying to backtrack on that promise. The Metro board may soon vote on whether to break the promise and kill Metro’s late night rail service. Washington, DC needs a Metro system that meets the needs of our residents, our workers, and our businesses. That means we need a Metro that stays open as late as our region does. 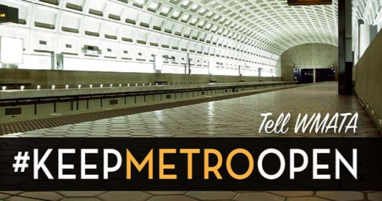 Sign the #KeepMetroOpen petition to let the Metro board know that you agree with Mayor Bowser: we are a world-class city that deserves a world-class Metro. 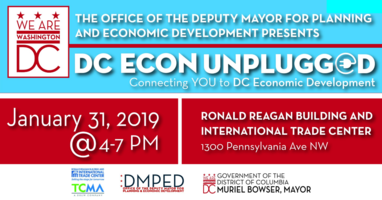 Today, join the Bowser Administration at DC Econ Unplugged, an event to connect residents and businesses to the services and resources that grow DC’s economy. From arts to housing, transportation to environment, come meet the people who keep Washington, DC the capital of inclusive innovation. During the winter months, the District provides additional services and supports to protect residents from life-threatening illness and injury associated with severe cold weather. 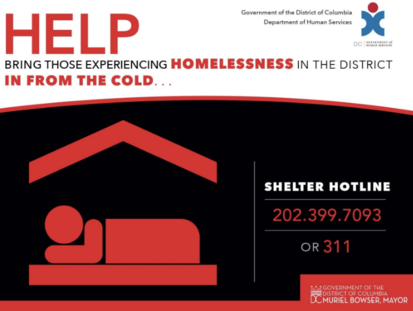 To request transportation to shelter for persons experiencing homelessness, contact the toll-free Shelter Hotline at (202) 399-7093 or by calling 311. Help keep all of our neighbors safe by saving the Shelter Hotline number in your phone. Learn more about DC's Cold Emergency Plan at snow.dc.gov. Women working full time in the United States are typically paid just 80 percent of what men are paid; the gap is even wider for African American, Latina, and Native women. 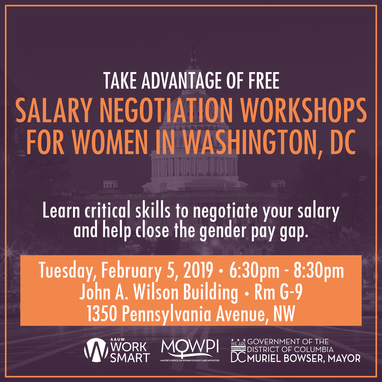 To help women get paid the salaries they deserve, the Mayor's Office on Women's Policy and Initiatives hosts salary negotiation workshops. At these two-hour workshops, participants learn how to confidently and successfully negotiate their salary and benefits packages and have the opportunity to practice their negotiation. Learn more and RSVP for the next workshop on Tuesday, February 5 HERE. This week’s District Minute features stories about the ribbon cutting at Anacostia Organics, the Mayor's visit to Chef José Andrés' food relief kitchen during the federal government shutdown, and the 100 Top Employers Engagement Forum. The Office of Unified Communications (OUC) consolidates the District's 911 and 311 call activities from the Metropolitan Police Department, Fire and Emergency Medical Services, and customer service operations. The mission of OUC is to provide a fast, professional, and cost-effective response to emergency and non-emergency calls in Washington, DC. OUC has an opening for an Electronics Technician. 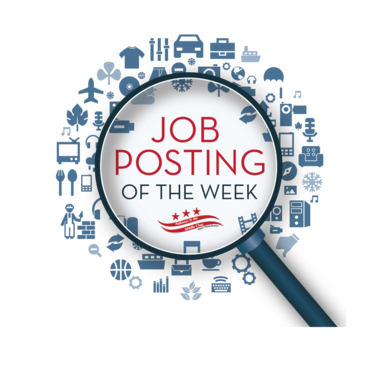 This position is responsible for modifying, installing, operating, and testing the full range of electronic equipment in the OUC. All details regarding this vacancy, including qualifications, can be found by visiting the job announcement.